Olive Ostrich visits her friends in North Woods. She wants to help them get ready for Christmas. But why does she hide her head in a hole? Will she be brave enough to sled down Scary Hill? And what surprise is hidden in the manger on Christmas Day? 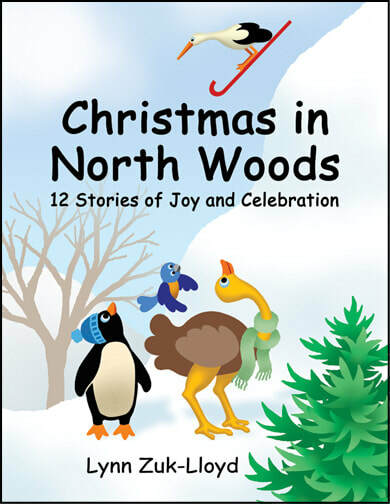 Christmas in North Woods contains 12 stories of joy and celebration that bring kindness and respect into difficult and challenging situations. It also shows fun, loving adventures that prepare hearts for Christmas by keeping Christ in the holiday. It contains delightful stories for children ages 4 to 8, but is enjoyed by people of all ages, especially grandmothers. "I can wholeheartedly recommend this children's book. The language is relatively simple and the art work is bright and colorful. Christmas in North Woods is a collection of 12 stories, each of which can stand independently but which tie together to make a "novel" about celebrating Christmas. There is enough text to keep child readers busy, and the pictures are attractive enough to keep non-readers looking at the pages as someone older reads the story to them. Christmas in North Woods is available on Amazon.